Companies exhibiting their prominence in the global rubber coated fabrics market include N-TORN Corp, ICP DAS Co., Ltd., Sixnet Holding LLC, L-Com, Inc., and Microsemi Corporation, finds Transparency Market Research (TMR). Top players seek to retain their stronghold by focusing on product innovations and by actively making product launches to meet current and emerging needs of various end-use industries, observes TMR. These initiatives by leading players are expected to raise the level of competition in the landscape over the years. Several players are tapping lucrative avenues in emerging economies, notably in Asia Pacific, in order to strengthen their positions. 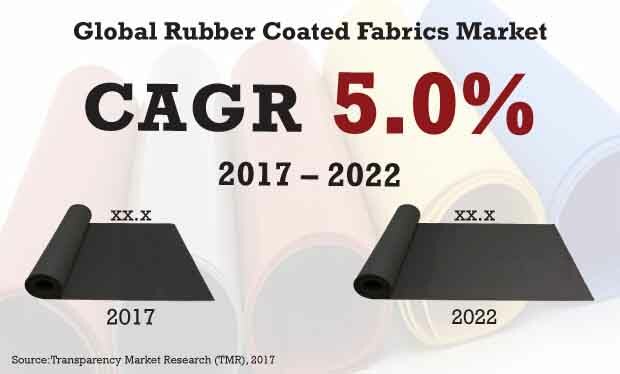 The global market for rubber coated fabrics stood at US$1.5 billion in 2017 and is projected to rise at a CAGR of 5.0% from 2017 to 2022. By the end of the assessment period, the global market is likely to touch a revenue valuation of US$2.0 billion. The key coating types comprise transfer coating, direct coating, and solidification coating, of which transfer coating accounts for the leading share in the global market. The segment is projected to reach a valuation of US$790.5 million by the end of 2022. The dominant demand for transfer coating notwithstanding, other segments are also expected to pick up over the years. The various regional markets for rubber coated fabrics market are North America, Latin America, APEJ, Europe, and the Middle East and Africa. Among these, APEJ is anticipated to emerge as one of the most lucrative markets. The regional market is likely to account for the leading global share and is anticipated to rise at a CAGR of 5.3% CAGR during 2017–2022. Meanwhile, Europe is a potentially attractive market expected to collect substantial revenue by the end of the forecast period. The rubber coated fabrics is driven primarily by the burgeoning use in several end-use applications including industrial, aerospace, automotive, and construction, and defense and public safety. The staggering quantum of investments in these industries in several industrialized nations and emerging economies is boosting the market. The substantial use of rubber-coated fabrics in a variety of applications such as protective garments, gymnasium mattresses, lifeboats, boats, rainwear, storage bags, and food conveyor belts, is driving the market. The extensive demand for rubber coated fabrics in automotive industry, such as in making automotive upholstery, is accentuating the growth of the market. The market is expected to immensely benefit from the rapid strides made by the transportation industry in various regions. Coupled with this, vast infrastructural upgrades being planned in the railway sector in several developing and developed nations are likely to fortify the uptake. In particular, the expansion of metro in these nations will spur the demand for rubber coated fabrics. The recurrent focus on implementing workplace safety norms in various industries where the workers are involved in the hazardous work has bolstered the demand for protective clothing. This in turn is boosting the adoption of rubber-coated fabrics. Emerging economies world over, especially in Asia Pacific, are presenting substantial avenues for manufacturers. The robust advances made by public infrastructure supported by public and private investments are likely to aid in the expansion of the rubber coated fabrics market. A rise in demand for home decoration products will also stoke the demand for rubber-coated fabrics in developing economies. In the coming years, the commercial and industrial sectors are expected to create potential growth prospects in the global rubber coated fabrics market. Recent advances in material sciences and constant advancements in manufacturing technologies are crucial factors expected to unlock promising avenues in the market. The swift pace of industrialization and the striking strides taken by infrastructure developments in emerging economies will help in the rapid expansion of the market.